I would be so sad to move from here - it is just off the kitchen (main hub of the house) so when I am working I feel part of things but can get on, and the children can come and see me anytime - I can generally stop what I am doing, if needed! All my music is set up in here, the computer, the phone, my thinking chair... - so as you can see, I really didn't want to move! I set my husband to have a think - he is fab at DIY, thank goodness, and likes a project. He decided more shelves were the answer, so everything has a place, a bit out of the way. Now, unlike most artists, I can't work in a mess, so I liked this idea and this is what he built me over the weekend, and I couldn't be happier! I can stay put - whoop whoop! Before! 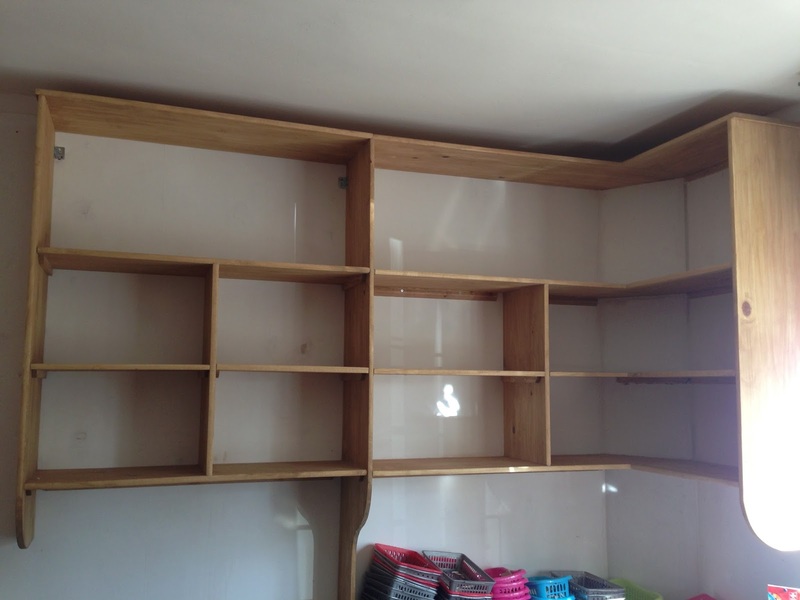 Holes filled in, wall sanded and ready for a lick of paint, before the shelves go up. 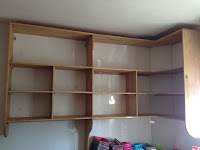 Ta dah - my lovely shelves! After! A place for everything! I just like sitting in here and giving it all a good coat of looking - us mosaic artists don't get out much!! Mosaic Kandinsky wall hanging finished! The mosaic Kandinsky wall hanging is finished, and here it is in all its glory! Very pleased with it - and in real life, the colours and textures are stunning! It is 50cm x 160cm, and has been commissioned for a house in Devon, in which all the other walls are blank. I will post pictures of it in situ when I have them. Have a look at my short films! My Mosaics-ready-to-post Shop - do take a look! Pixels - order my original designs as canvas prints, cards, phone covers and much more! Read some of my past blogs.